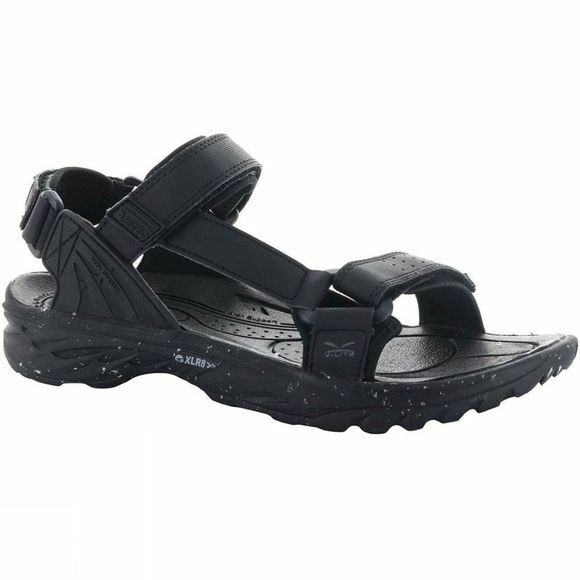 The Mens V-Lite Wild-Life Vyper Sandal from Hi-Tec are ideal for the summer months and hot weather holidays. These men's walking sandals are fully adjustable with three hook and loop fastenings to provide a secure and comfortable fit. The V-Lite construction keeps them incredibly lightweight, making them ideal for walking. A protective moulded heel chassis and lightweight, durable fork shank offer stability while the high performance durable synthetic upper and non-wicking contoured insole provides support and further comfort. These durable men's walking sandals also have an ultra impact-absorbing high rebound XLR8>> midsole which offers long-lasting underfoot cushioning, and a Multi-Directional Traction (MDT) lug/tread design outsole for improved grip on varied terrain. These fully adjustable men's walking sandals are designed to take you from town to coast.